Dai-kon, from the Japanese words meaning large root, is the name of the long, white radish that is making a return in this week's share. Daikons can be daunting. It's alright if this root has you scratching your head. Daikon radishes have a mild bite making them the perfect winter vegetable to incorporate into your cooking. 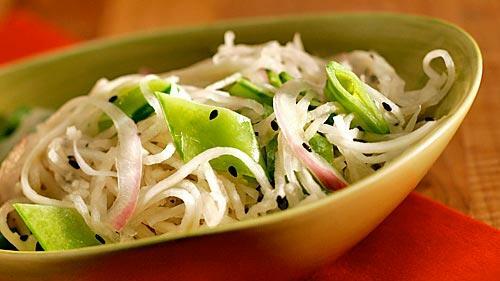 Otherwise known as mooli or a Japanese radish, daikon has been long valued for the root’s nutritional properties. When served raw, it possesses a mild and tangy flavor, significantly less peppery than that of other radishes. When cooked, it tastes like cooked turnips. As a cruciferous vegetable, daikon is often pickled and prepared as a complimentary side dish. The vegetable offers a myriad of health benefits, including the ability to improve digestion and blood circulation. In some cases, the juice of a daikon radish can be used to treat headaches, fever, and hot flashes, as it has significant anti-inflammatory effects. Daikon radishes can be prepared just as you would a carrot. They make a wonderful addition to soups and meat dishes, but here are some recipes that place the daikon radish front and center. Enjoy! 1. Trim and peel the daikon radish, then cut it crosswise into 3-inch pieces. Julienne the pieces, then place the julienned strips into a large bowl, and toss in the onion and snow peas. 2. In a medium bowl, whisk together the sesame oil, rice vinegar, sugar and salt. Pour half of the dressing over the slow and toss to coat. Add more dressing as needed, a couple of tablespoons at a time, until the slaw is lightly coated and flavorful; you may not need all the dressing. This makes about 8 cups of slaw. 3. Cover and refrigerate the slaw for at least 1 hour for the flavors to develop. Before serving, toss with the black sesame seeds. The slaw will keep for 1 day, refrigerated. You've heard of banana chips but have you tried radish chips? 3. They cook really fast so be careful! 1. Place grated daikon and water in a small saucepan and bring to a boil. Reduce heat to low and simmer, stirring occasionally, for about 15 minutes. Remove from heat and let cool. 2. Meanwhile, mix the remaining ingredients together in a large bowl. Add the radish and cooking water and stir to form a dough. 3. Transfer dough to a greased 8x8 pan and press down with a spatula to smooth the top (the dough should be about ½ inch high and will only fill about two-thirds of the pan). 4. Place the baking pan in a steamer and steam for 35-45 minutes. 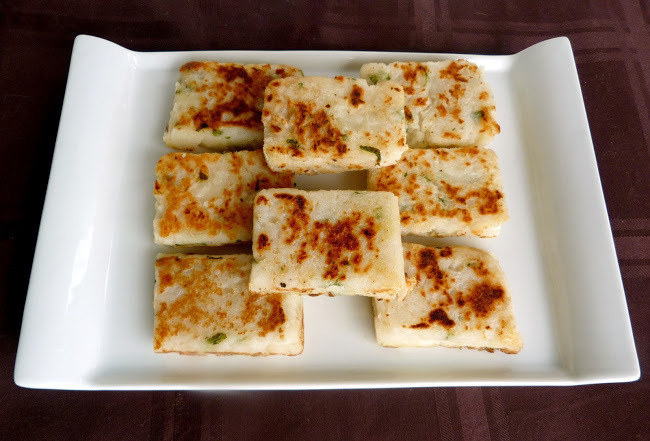 Remove the dough from the pan and slice into squares. 5. Heat about 1-2 tsp vegetable oil in a large skillet over medium heat. Transfer squares to the skillet and sauté for about 3-4 minutes per side, until they are lightly browned.